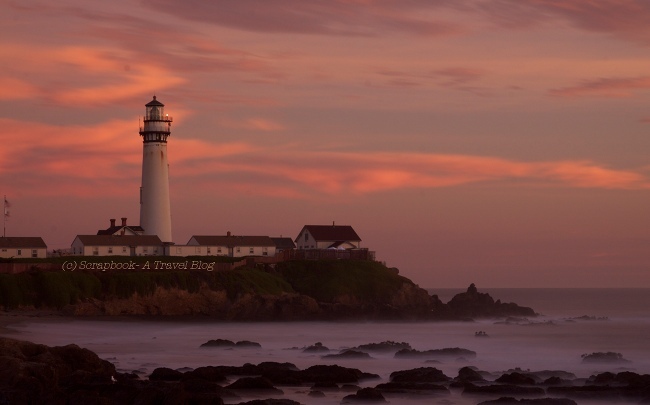 Pigeon Point Lighthouse is one of the picturesque lighthouses on California coast. It is one of the photographer's favorites. I was coming back from a photoshoot-meetup, driving on highway-1 at sunset and I happened to be near this lighthouse. The colorful sky in the background looked amazing! The quiet on the seashore except for the waves was soothing the soul. The original lens of this lighthouse is illuminated once a year on first sunday of November. It is a wonderful sight! For more Colorful Skies click HERE. Lighthouses make such a wonderful subject for pictures. Love the atmosphere here. Such a gorgeous sky you have this week. Love that lighthouse! Oh wow, I have to put this on my list. A CA native and never been to this lighthouse. Beautiful! What a beautiful lighthouse and what a glorious way to end a day -- any day! Superb capture, Kusum!! Wishing you a beautiful weekend! Enjoy! The sky looks a beautiful crimson and grey. But just look at the water, it is violet! What reflected in it to become violet?! Nature is seriously magical, and this is indeed a gorgeous shot. That is an extraordinary composition. Great shot!! Incredibly beautiful capture! The lighthouse looks stunning!! A lovely splash of colors around majestic lighthouse, Kusum! What a gorgeous sky and a beautiful photo. I love the lighthouse. Happy Skywatching! Stunning scene!! Boom & Gary of the Vermilon River, Canada. Lighthouses and sunsets - two of my favourite things!! Question on the waves - Was the pic taken at low shutter speed? Thanks Ajeya. Yes, I it is a long-exposure shot using a tripod. lovely image , removing noise from it would make this look even more better!